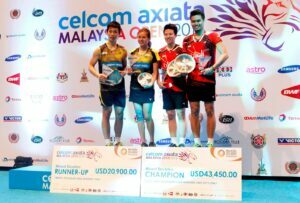 The 2019 Malaysia Open, officially the CELCOM AXIATA Malaysia Open 2019, is a badminton tournament which takes place at Axiata Arena in Malaysia. It has a total purse of $700,000. The sports event was held in Kuala Lumpur, the capital city of Malaysia. Lin Dan of China won in Men’s Singles category after defeating Chen Long of China. Tai Tzu-ying of Chinese Taipei won in Women’s singles after defeating Japan’s Akane Yamaguchi.